My Life Check® was designed by the American Heart Association with the goal of improved health by educating the public on how best to live. … This seven step list has been developed to deliver on the hope we all have–to live a long, productive healthy life. Another study of physical activity concluded that marathon training improved cardiovascular risk factors among middle-aged, recreational runners who prepared for the Boston Marathon. Jodi L. Zilinski, MD, of Massachusetts General Hospital led the study of 45 male runners, ages 35 to 65, who trained for 18 weeks in advance of the 2013 marathon. Their race preparation led to significant changes in cardiovascular risk: LDL was reduced by five percent overall among participants; total cholesterol fell four percent and triglycerides fell 15 percent. The men collectively showed a four percent increase in peak oxygen consumption. Jonathan H. Kim, M.D., et al. 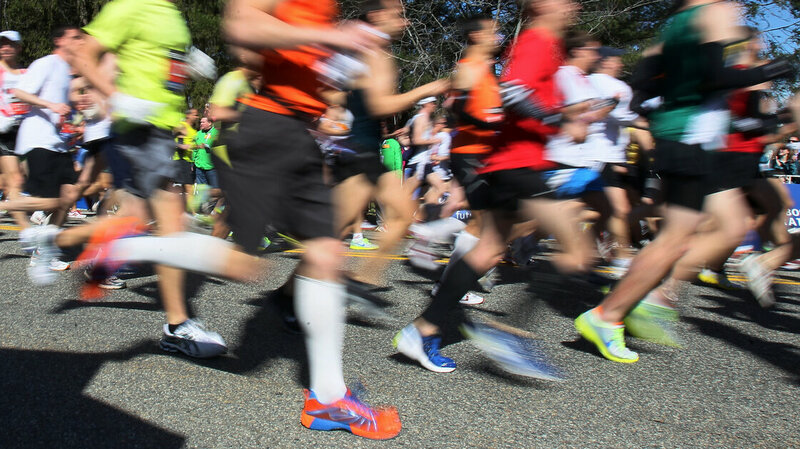 Cardiac arrest, most commonly attributable to hypertrophic cardiomyopathy or atherosclerotic coronary disease, occurs primarily among male marathon participants; the incidence rate in this group increased during the past decade. Hereditary factors play the most important role in determinin g individual serum cholesterol concentrations; however, dietary and environmental factors also play a part, and the most beneficial of these is the substitution in the diet of polyunsaturated and monounsaturated fatty acids for saturated fatty acids. Plant oils such as corn oil and sunflower seed oil contain a high proportion of polyunsaturated fatty acids, while olive oil contains a high concentration of monounsaturated fatty acids. On the other hand, butter fat, beef fat, and palm oil contain a high proportion of saturated fatty acids. Sucrose and fructose have a greater effect in raising blood lipids, particularly triacylglycerols, than do other carbohydrates. The reason for the cholesterol-lowering effect of polyunsaturated fatty acids is still not fully understood. It is clear, however, that one of the mechanisms involved is the upregulation of LDL receptors by poly- and monounsaturated as compared with saturated fatty acids, causing an increase in the catabolic rate of LDL, the main atherogenic lipoprotein. In addition, saturated fatty acids cause the formation of smaller VLDL particles that contain relatively more cholesterol, and they are utilized by extrahepatic tissues at a slower rate than are larger particles—tendencies that may be regarded as atherogenic. Why lipids are deposited into the walls of large and medium-sized arteries—an event with potentially lethal consequences—is not known. Lipoproteins are usually classified on the basis of density, which is determined by the amounts of triglyceride (which makes them less dense) and apoproteins (which makes them more dense). The least dense particles, known as chylomicrons, are normally found in the blood only after fat-containing foods have been eaten. Least dense are the large, very-low-density lipoproteins (VLDL), consisting mainly of triglyceride. Middle-aged men whose serum cholesterol levels are in the highest quintile for age (above about 230 mg/dL or 5.95 mmol/L) have a risk of coronary death before age 65 years of about 10%; men in the lowest quintile (below about 170 mg/dL or 4.40 mmol/L) have a 3% risk. Death from CHD before age 65 years is less common in women, with equivalent risks one-third those of men. The exact mechanism by which LDL particles result in the formation of atherosclerotic plaques—or the means whereby HDL particles protect against their formation—is not known. The natural oxidation of LDL particles may be particularly atherogenic. Receptors on the surface of macrophages within atherosclerotic plaques bind and accumulate oxidized LDL. The formation of antibodies to oxidized LDL may also be important in plaque formation. 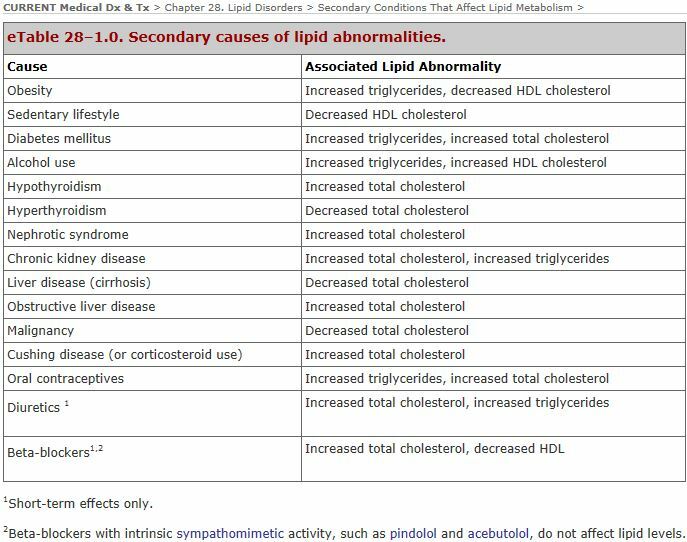 Familial hypercholesterolemia, rare in the homozygous state (about one per million) is a condition in which the cell-surface receptors for the LDL molecule are absent or defective, resulting in unregulated synthesis of LDL. Genome-wide association studies have identified additional genetic variants responsible for differences in serum lipids. In fasting serum, cholesterol is carried primarily on three different lipoproteins—the VLDL, LDL, and HDL molecules. Two persons with the same total cholesterol of 275 mg/dL (7.11 mmol/L) may have very different lipid profiles … The second would have more than a tenfold higher CHD risk than the first, assuming no differences in other factors. There is no true “normal” range for serum lipids. In Western populations, cholesterol values are about 20% higher than in Asian populations and exceed 300 mg/dL (7.76 mmol/L) in nearly 5% of adults. About 10% of adults have LDL cholesterol levels above 200 mg/dL (5.17 mmol/L). Total and LDL cholesterol levels tend to rise with age in persons who are otherwise in good health. Most patients with high cholesterol levels have no specific symptoms or signs. Reducing cholesterol levels in healthy middle-aged men without CHD (primary prevention) reduces their risk in proportion to the reduction in LDL cholesterol and the increase in HDL cholesterol. Treated adults have statistically significant and clinically important reductions in the rates of myocardial infarctions, new cases of angina, and need for coronary artery bypass procedures. Rosuvastatin … JUPITER … a combined end point of myocardial infarction, stroke, revascularization, hospitalization for unstable angina, or death from cardiovascular causes in both men and women. The NNT for 1 year to prevent one event was 169. Primary prevention studies have found a less consistent effect on total mortality. The JUPITER trial … reduction in death from any cause. The NNT for 1 year was 400. In patients with CHD, the benefits of cholesterol lowering are clearer. The NNT to prevent a non-fatal myocardial infarction or a coronary artery disease death in these three studies were between 12 and 34. Aggressive cholesterol lowering with these agents causes regression of atherosclerotic plaques in some patients, reduces the progression of atherosclerosis in saphenous vein grafts, and can slow or reverse carotid artery atherosclerosis. Meta-analysis suggests that this latter effect results in a significant decrease in strokes. Results with other classes of medications have been less consistent. The disparities in results between primary and secondary prevention studies highlight several important points. The benefits and adverse effects of cholesterol lowering may be specific to each type of drug; the clinician cannot assume that the effects will generalize to other classes of medication. Second, the net benefits from cholesterol lowering depend on the underlying risk of CHD and of other disease. In patients with atherosclerosis, morbidity and mortality rates associated with CHD are high, and measures that reduce it are more likely to be beneficial even if they have no effect—or even slightly harmful effects—on other diseases. Dr. Sidney Smith, at the University of North Carolina, was one of the guideline writers. The American College of Cardiology and the American Heart Association have been sifting the evidence for four years to come up with the most up-to-date advice. a high dose of statins, drugs such as Lipitor, Zocor or Crestor, or their generic equivalents. They cost from $4 to $150 a month. If you’re an adult under 75 and don’t have any of these risks, your doctor should check your odds of suffering a heart attack or stroke in the next 10 years, using a new risk calculator. If your 10-year risk is seven and a half percent or higher, the guidelines say you should be on a moderate dose of statin. 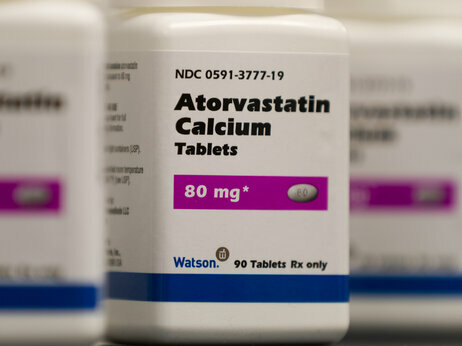 Dr. Sidney Smith says the new guidelines should actually make life simpler for doctors and patients because most don’t have to worry about starting a statin if their cholesterol reaches a certain point or about getting it down, through drugs, to a specific number target. But others think the new guidelines are more complicated. DR. STEVEN ATLAS: Much more complex. That’s Dr. Steven Atlas, a primary care doctor in Boston, who actually thinks new cholesterol guidelines are overdue. Roughly half the cholesterol panel members have financial ties to makers of heart drugs, but panel leaders said no one with industry connections could vote on the recommendations. “It is practically impossible to find a large group of outside experts in the field who have no relationships to industry,” said Dr. George Mensah of the heart institute.